Christmas isn't really a time to eat healthily. And, let's be honest, who wants to? But all the mince pies and chocolate will catch up to you eventually, which is why I always amp up my workouts over December and January, which I'll go into in greater detail in tomorrow's 'How To Beat Winter Weight Gain' post without having to sacrifice festivities. But one way to offset the goodies is with a few healthier alternatives. Don't roll your eyes. Think about it. Why do we eat these delicous things at Christmas? Is it because we want to eat full fat food? Or because we want to eat more sugar? Or less protein? No, it's because we want the taste! And it's possible to get those tastes without making your waistline suffer. 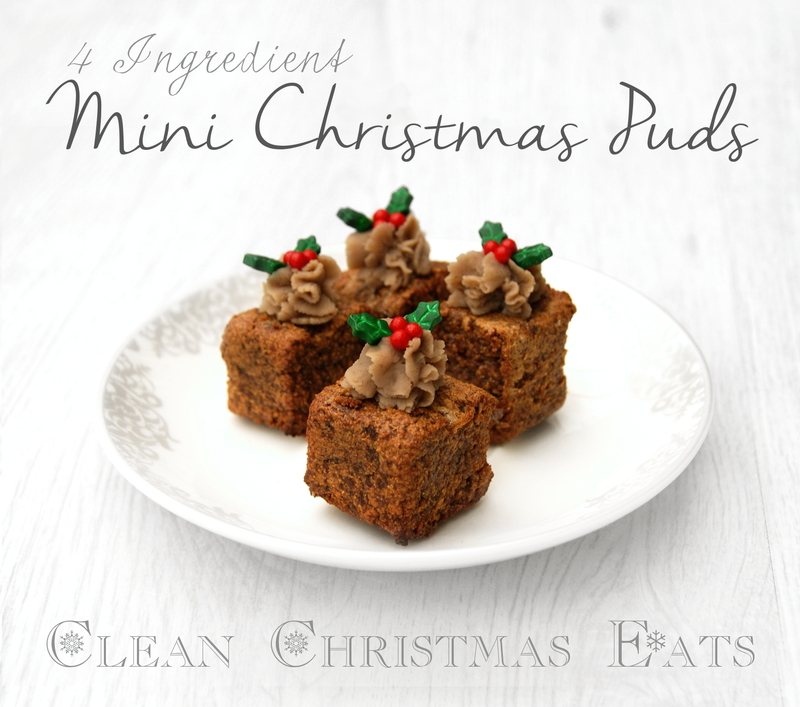 So, the first of my healthy Christmas snacks: 4-ingredient healthy Christmas puddings which are gluten-free, to boot! With a foundation of dates (think caramel and sticky toffee), chestnut flour for added sweetness without moisture, protein powder and mixed spice, you can have your Christmas cake and eat it, too! 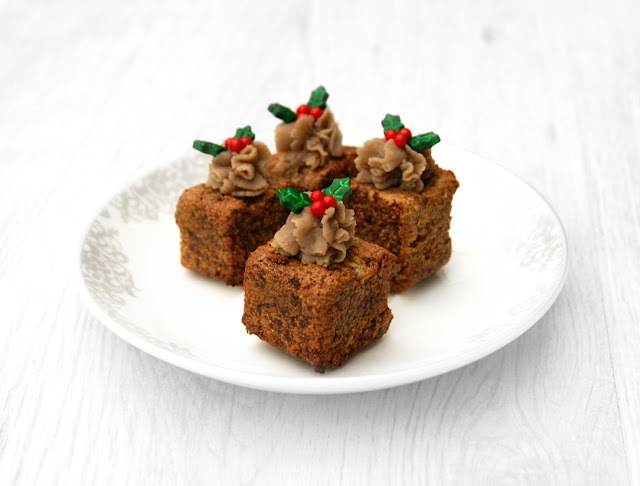 Like a bite of sticky toffee pudding with a festive spice & chestnut twist, gentle baking dries out the surfaces, making them easy to handle and giving them a slight crunch on the outside while still soft, chewy and slightly doughy inside. 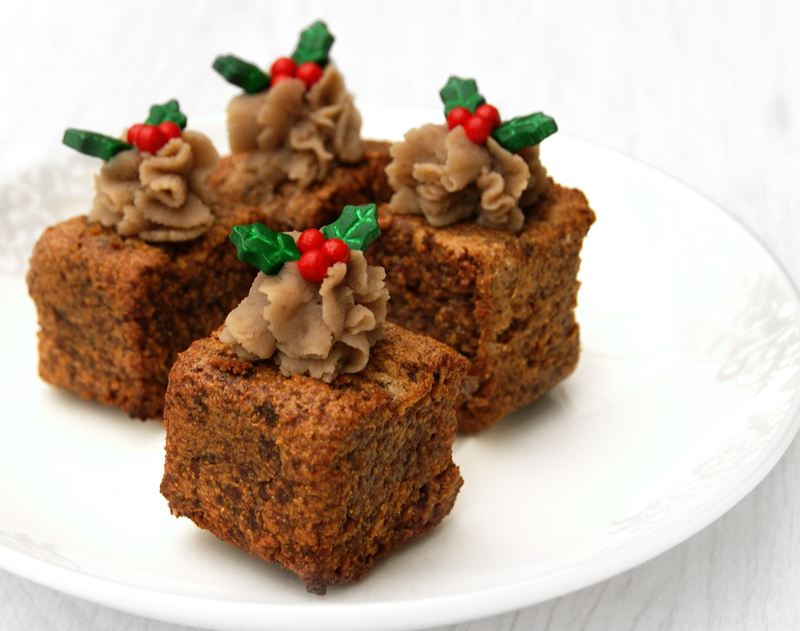 If, however, you'd prefer raw Christmas puddings, just omit the water from the recipe and don't put them in the oven. They're stickier and the spices don't come out quite as well, but they're still very good. The recipe is easy to increase for making healthy Christmas canapés, or you could increase the recipe by 4 and make a single full-sized Christmas pudding to serve more traditionally. 1. Put the dates in a blender or food processor and blitz for about 30 seconds. 2. Add the protein powder, chestnut flour and spices and blend until combined. It will take a while and look very, very dry - so much so that the flour just isn't mixing. Give it time, and stop every 30-60 seconds to scrap down the sides of the machine. Eventually it'll turn into combined crumbs. 3. Remove the crumbs and transfer into a bowl with 1 tbsp of water and mix with a spoon. Add more water if necessary until you get a paste/dough. 4. Heat the oven to 180 C/350 F/gas mark 4. 5. Remove the paste and transfer onto a sheet of clingfilm, cover and begin to shape into a bar. 6. Transfer the bar onto a sheet of parchment on a baking tray and cook for 5 minutes. 7. Remove the bar from the oven and turn it over - roll it over on the parchment and carefully peel it away from the base so its underside is facing up. Heat for another 5 minutes. 8. Remove and cut into 4 pieces. Reshape into cubes if necessary. Set them on the parchment and put back in the oven for 5 minutes. 10. Transfer some chestnut purée into a piping bag with an icing nozzle and squeeze a little on top of each. Add any additional decorations and serve. • I used Pulsin whey powder here, but I used hemp in last year's chestnut bites. • I used Merchant Gourmet chestnut purée. • You can always sweeten the purée with a little bit of sugar, mixing to combine then transferring to a piping bag rather than using it straight from the packet. • I put the puds on a set of electronic scales, set it to 0 and piped the purée with zeal and disregard. • Checking once I'd finished, across all 4 of the puds, the weight increased by only 11g. So it's safe to assume that the below nutritional info for 10g of chestnut purée will actually be perfect for this recipe. • I decorated them with a few Wilton holly sprinkles. The purée, at least without sugar, isn't sticky, so the decorations need a little more care when applying. You could also use powdered sugar for 'snow', or chestnut flour, as the flour is sweeter than the purée.